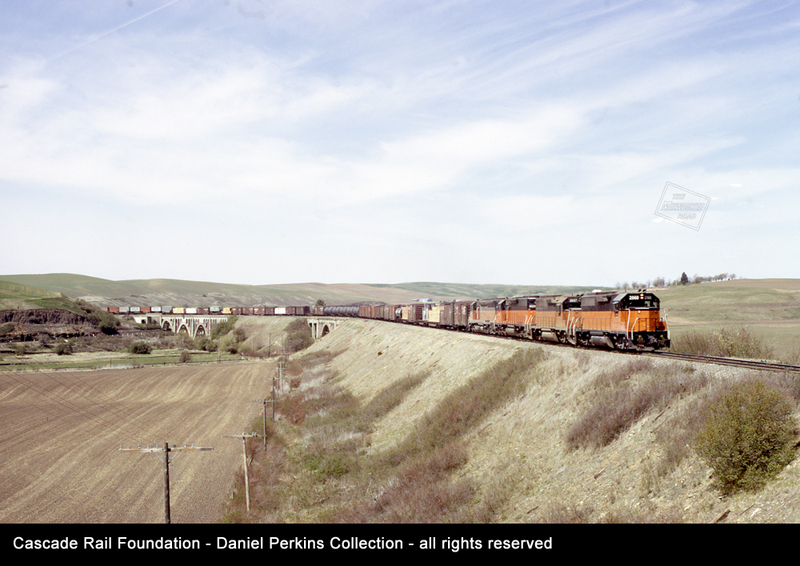 Explore the route of the historic Milwaukee Road railroad route across Whitman County in an historic photographic presentation at the Whitman County Library in Rosalia on Saturday, October 14 at 1 p.m. The presentation includes photographs from Cascade Rail Foundation’s collections, the Washington Rural Heritage collection, and other sources. This is an opportunity to explore the historic Rosalia Concrete Arch Bridges, Rosalia’s iconic landmark to the south. After the photo presentation, Cascade Rail Foundation Vice President Mark Borleske will lead a historic walking tour of the Rosalia Concrete Arch Bridges, south of Rosalia. The bridges are listed on the National Register of Historic Places. They were constructed in 1915, replacing temporary wooden trestles built in 1907. The walking tour of the Rosalia Railroad Bridges will begin at 2:15 pm from the crossing of Pine City Malden Road and the John Wayne Pioneer Trail/Iron Horse State Park. Parking off the road is available on the driveway just west of the trail. For the history walk, sturdy shoes are recommended for walking the gravel trail surface. Permits for trail use are included in the guided tour. Please dress for the weather and sturdy wheels are recommended for children. MILW EMD GP40 locomotives 2060 and 2037, with two more EMD locomotives, lead an eastbound train at Rosalia, WA on May 2, 1973. Daniel Perkins photo from the Cascade Rail Foundation Daniel Perkins Collection, all rights reserved.